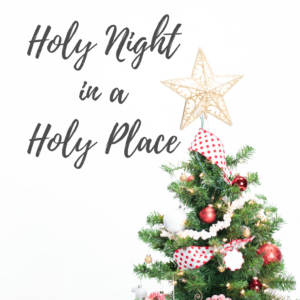 Will you sing Holy Night in a Holy Place? I love this time of year, don’t you? I want to believe that feeling is shared by most of us. As they say the numbers don’t lie. In America 96% of us will celebrate Christmas. I think that is incredible. To be quite honest, there are very few things that 96% of Americans do. I mean breathe oxygen, eat food and celebrate the most celebrated holiday of all. Listen, Christmas is one of the most sentimental and nostalgic holidays that we experience all year. All of us have memories that are brought back to the surface during this season. It is a really emotional time for a lot of people. Some of the memories rekindled have taken on a shade of sadness as we remember those we’ve lost, while others are filled with pure merriment and joy. They are vivid memories of Christmases past and simpler times; of childhood and the magical and whimsical feelings that accompany this time of the year. What memories are triggered in your mind this holiday season? What memories will you create this year with people you care about? For some, as you read this, you keenly remember from childhood the melting wax dripping from the small white candle held in your little nervous hand while singing “Silent Night” at a Christmas Eve service. You were mesmerized by the beauty of a sanctuary lit by candlelight as you peered about the room. I hope that won’t just be a memory this December, but instead a celebrated reality. I really hope that you will help those around you, especially the children in your life, to create that kind of lasting memory. So will you sing Holy Night in a Holy Place? Have you made plans? Who is coming with you? I invite you to join us at Elevation Church as we rekindle old memories and create new traditions this Christmas Eve. 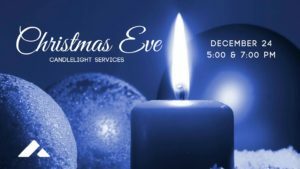 Our Christmas Candlelight services are at 5:00 and 7:00 pm. I hope to see you and your family on Christmas Eve, candle in hand and eyes full of wonder. Join us for inspirational music, a children’s story, and the Christmas Message as we remember the peace and joy of this holy season, and celebrate Jesus’s birth – the true light that shines in the darkness.